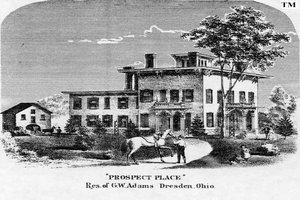 There have been many accounts related to the hauntings of Prospect Place in Trinway, Ohio. Noted as one of the most haunted places in Ohio, this elegant structure once served as one of the “stations” of protection during the time of the Underground Railroad that worked to deliver slaves to freedom. While it has been most noted as being “Prospect Place”, many will refer to it as “George Willison Adams House”. Today, it mysteriously stands and seems to hold a portal to the paranormal. Here, you will learn about the hauntings of Prospect Place in Trinway, Ohio. Read on to learn why this is considered to be one of the most haunted places in Ohio. It is said that, at one point in history, a “bounty hunter” for slaves arrived at Prospect Place. This individual demanded that the ever-popular G.W Adams release all of the slaves that he possessed. This individual speaking to Adams intended to do the slaves harm. G. W Adams was not going for that! He quickly pulled out a weapon and pursued in a fight with the man. Eventually, numerous slaves came to assist Adams with their own weapons. It was then that the stranger left. It is rumored that the slaves pursued him, and then murdered him in the barn. It is also believed, to this day, that the evil, angry spirit of the bounty hunter remains in that barn. Many have felt an evil presence, fear, and even like someone or something are touching them! During the time of the Underground Railroad, many slaves who were in search of freedom stayed in the basement of Prospect Place. It seems that one of the slaves experienced an injury to the head area on her way here. Naturally, everyone who resided in the home tried to nurse her back to health, but she passed away. Now, it is said that she still resides in the basement area. She is actually considered to be quite friendly, and seems to overlook and protect the home. Many who have had supernatural experiences with this particular spirit have said that she almost seems like a “happy” spirit. William Cox married the first daughter of G.W Adams, Anna. He came from a family with a lot of wealth and finer luxuries. Once Prospect Place was left to him and his wife, he renovated a lot of the building. Eventually, he boarded a train to visit another city for business. He and another man checked into a hotel, then left the following morning. To this day, he has not been found. Many believe that seeing that he left Anna with so many hardships to ensure once he was gone that his spirit roams the house trying to find a way to apologize and request forgiveness. There are many strange and unusual happenings at Prospect Place in Ohio. This is why it is considered to be one of the most haunted places in Ohio. Are you interested in paranormal research? Does the thought of “ghost hunting” excite you? If you answered “yes”, check out Prospect Place today!